Fridays are a segway into the weekend, and what better way to enter your weekend, then with good karma, and a smile in your heart. No, seriously. I just recently re-watched the Pay it Forward, Warner Bros. Movie (2000), and was inspired to do this post. I was going to make up my own little video, but it seemed like a lot of work, I'd have to see if my computer had an ap for it, learn how to use it, so on, and so forth..... Although I have no doubt that I could fulfill this endeavor, I decided it was easier to look on You Tube for one...and low and behold...posted by a gentleman from www.myspace.com/payforward. Plus, I figured my time would be better spent finding my first 3 candidates. Coincidentally, I am not the only creative genius to come up with this idea (maybe not Pay it Forward Fridays, but something similar). 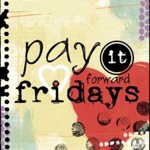 There is also a whole Pay it Forward Movement (http://www.payitforwardmovement.org), and a Foundation to go along with it. I know I will, & I will post about it later... you should too! Ok, great idea, and I LOVED the movie, too. what a great idea. we have to be intentional in life, or it can just pass us by. thanks for the inspiration! Loved the movie, and love the idea! Thanks for sharing...will def do. Thanx Corine :) Will be looking out for ya!! Your welcome, feel free to drop by anytime :) It was a great movie, wasn't it?